Medical illustrators and photographers use graphics, draw­ings, and photographs to make medical concepts easier to understand. Medical illustrators provide illustrations of anatomical and biological structures and processes, as well as surgical and medical techniques and proce­dures. Medical photographers take photos that commu­nicate complex medical or scientific information for use in textbooks, professional journals, and other teaching materials. Illustration featured prominently in the ancient civiliza­tions of Mesopotamia, Egypt, and later Greek and Roman civilizations. Drawings depicting biological, zoological, and medical knowledge have also been found among ancient Assyrian, Babylonian, Egyptian, and Chinese soci­eties. Modern illustration began during the Renaissance of the 15th and 16th centuries, with the work of Leonardo da Vinci, Andreas Vesalius, and Michelangelo Buonarotti. In 1625, Francesco Stelluti used the newly invented microscope to create a series of drawings of a honeybee that were magnified 10 times. The microscope became an important tool for illustrators seeking to represent details of biological and medical processes. Over time, tools have been developed to aid illustra­tors and photographers in their work. Illustrators have made use of parallel bars, compasses, French curves, and T-squares, but the development of computer technology has largely replaced these mechanical tools with com­puter-aided design software. For medical photographers, the growing sophistication of cameras has made it pos­sible to accurately capture medical processes with com­plete clarity. Medical illustrators work in a specialized area of techni­cal illustration. These illustrators are concerned with rep­resenting human anatomy and processes, as well as other biological information. Their work is found in medical textbooks, magazines and journals, advertisements for medical products, instructional films and videotapes, television programs, exhibits, lectures and presentations, and computer-assisted learning programs. Some medical illustrators create three-dimensional physical models, such as anatomical teaching models, models used for teaching medical procedures, and also prosthetics. The role of the medical illustrator is to aid in mak­ing medical and biological information, procedures, and techniques more understandable. They combine knowl­edge of biology and anatomy with strong artistic and graphic skills. Medical illustrators generally work with physicians, surgeons, biologists, and other scientists. When detailing a surgical procedure, they may observe the surgeon dur­ing surgery and ask them for advice about which parts of an operation to illustrate. Medical illustrators draw parts of the body, such as the eye, the skeletal structure, or the structure of a cell, for books, encyclopedias, medi­cal product brochures, and related literature. They may illustrate the work of researchers, depicting research on new organisms or drugs. They may also assist in devel­oping sophisticated computer simulations that allow physicians in training to “perform” a surgical procedure entirely on a computer before they are skilled enough to operate on actual patients. A medical illustrator may work in a wide range of medical and biological areas or specialize in a particu­lar area, such as cellular structure, disease, or the heart. Much of their work is done with computers; however, they must still have strong skills in traditional drawing and drafting techniques. Like illustrators, photographers can vary their style depending on the purpose of a photograph. 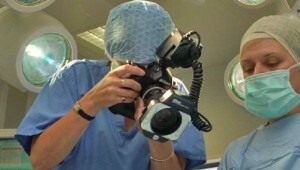 They often take photos to document patients’ conditions before and after surgery, for example. This task requires technical proficiency in photography, but does not call for innova­tive use of space or lighting in a shot. Photos taken for brochures or advertising materials, however, can be styl­ized and dramatic. In this case, medical photographers use lighting, camera angles, and design principles to cre­ate different effects in their photos. While in high school, make sure to develop your skills in the two areas you’ll need the most: science and art. Classes in anatomy, chemistry, biology, and nutri­tion are all helpful science topics. Aside from taking illustration and/or photography, check out classes in visual design, if available. Most medical illustrators and photographers use computers in their artwork, so gain familiarity with digital cameras and computer art, design, and layout programs. Most medical illustrators obtain a bachelor’s degree in either art or biology. After college, they are required to complete an advanced degree program in medical illus­tration accredited by the Commission on Accredita­tion of Allied Health Education Programs (CAAHEP). The programs, which last from two to three years, are offered by four U.S. schools and one Canadian institu­tion. Programs usually include training in traditional illustration and design techniques, computer illustration, two-dimensional and three-dimensional animation, prosthetics, medical computer graphics, instructional design and technology, photography, motion media pro­duction, and pharmaceutical advertising. Course work will also include pharmacology, basic sciences including anatomy and physiology, pathology, histology, embry­ology, neuroanatomy, and surgical observation and/or participation. Most medical illustrators are members of the Associa­tion of Medical Illustrators (AMI). The AMI works with the CAAHEP to establish accreditation and curriculum standards, offer certification in medical illustration, and provide other educational and support services to mem­bers and prospective members of this profession. Medical photographers must finish a bachelor’s or associate’s degree that emphasizes art and photography. Very few schools offer graduate programs in medical photography. Completing a postsecondary degree in a photography-related field and taking additional course work in science will prepare you for this career. The Association of Medical Illustrators offers the des­ignation, certified medical illustrator. To be eligible, applicants must graduate from an accredited program or obtain at least five years’ experience and complete a course in gross anat­omy with hands on dissection. Medical illustrators and pho­tographers need to continue their education and training while pursuing their careers. Licens­ing is not required in either field. 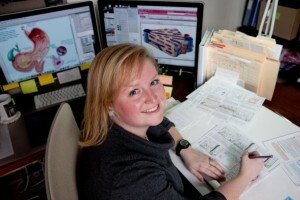 While certification is not man­datory, you must keep up with the latest innovations in design techniques, computer software, photography equipment, and presentation technology, as well as technological advances in the fields for which you provide illustrations and photos. To be a successful medical illus­trator or photographer, you should possess manual dexter­ity, have good eyesight and color vision, and enjoy working with detail. Self-employed (or free­lance) medical illustrators and photographers need good busi­ness and marketing skills. You can explore an interest in this career by taking art and photography courses. Participation in science clubs and fairs is also a good idea. Artists can always improve their drawing skills by practicing on their own, either produc­ing original artwork, or making sketches from scientific drawings that appear in textbooks and reference manu­als. Visit the AMI or BCA Web sites (listed at the end of this article) for galleries of award-winning images. Both medical illustrators and photographers are employed at hospitals, medical centers and schools, and academic institutions. Laboratories, pharmaceutical companies, publishers of medical and scientific text­books, and advertising agencies also employ illustrators and photographers. Graduates of medical illustration programs should develop a portfolio of their work to show to prospective employers or clients. Most schools offer career counsel­ing and job placement assistance to their graduates. Job ads and employment agencies are also potential sources for locating work. Likewise, aspiring medical photogra­phers should assemble a professional portfolio of their best photos to show potential employers. Medical illustrators and photographers can also find job placement assistance with the AMI and BCA. Begin­ning illustrators and photographers should consider join­ing one of these professional associations not only for job leads, but also to meet other workers in the field and stay on top of trends and advancements in the industry. After an illustrator or photographer gains experience, he or she will be given more challenging and unusual work. Those with strong computer skills will have the best chances for advancement. Illustrators and photog­raphers can advance by developing skills in a specialized area, or even starting their own business. Individuals who work for large hospitals or teaching institutions can become managers of media and com­munications departments. 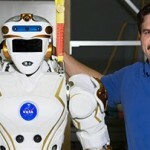 They can also go into teach­ing in colleges and universities at the undergraduate and graduate levels. According to the AMI, medical illustrators who have graduated from accredited graduate programs start at around $40,000 to $45,000 per year. The average pay for an experienced medical illustrator ranges from $45,000 to $75,000 per year, depending on location and level of experience. At the high end, medical illustrators can earn $100,000 to $200,000 per year, particularly if they com­bine freelance work with a full-time position. Medical photographers generally earn salaries simi­lar to medical illustrators at the entry level. The field’s competitiveness, though, sometimes leads to lower sala­ries for experienced photographers—around $35,000 to $40,000—than for experienced illustrators. Medical illustrators and photographers employed by hospitals and other large institutions generally receive good benefits, including health and life insurance, pen­sion plans, and vacation, sick, and holiday pay. Medical illustrators generally work in clean, well-lit offices. They spend a great deal of time at their desks, whether in front of a computer or at the drafting table. They are sometimes required to visit operating rooms. Photographers, especially those employed by a large hospital, may have to run around during their day. They may be asked to take photos of a complicated surgery in the morning, and then shoot pictures at an official hospital event that night. They also may spend time in a darkroom or in front of a computer, looking for and preparing photos for publishing. The outlook for employment as a medical illustrator is good. Because there are only a few graduate programs in medical illustration with small graduation classes, medi­cal illustrators will find great demand for their skills. The field of medicine and science in general is always grow­ing, and medical illustrators will be needed to depict new techniques, procedures, and discoveries. The demand for medical photographers has declined somewhat in recent years. Cost-cutting measures at insti­tutions have led to increased purchases of stock photog­raphy rather than hiring photographers to take original photos. Some physicians also take their own photos, or rely on media members to take them. Despite slower growth, the constantly developing field of scientific information will ensure a continued need for medical photographers.